The apartment we rented in Paris was near the Eiffel Tower. It was very comfortable and at night we would sit by the window and drink Champagne as we looked at the tower with its bright lights. Before leaving home, Michele made reservations in some of our favorite Bistros and we looked forward to a week of great eating and drinking. 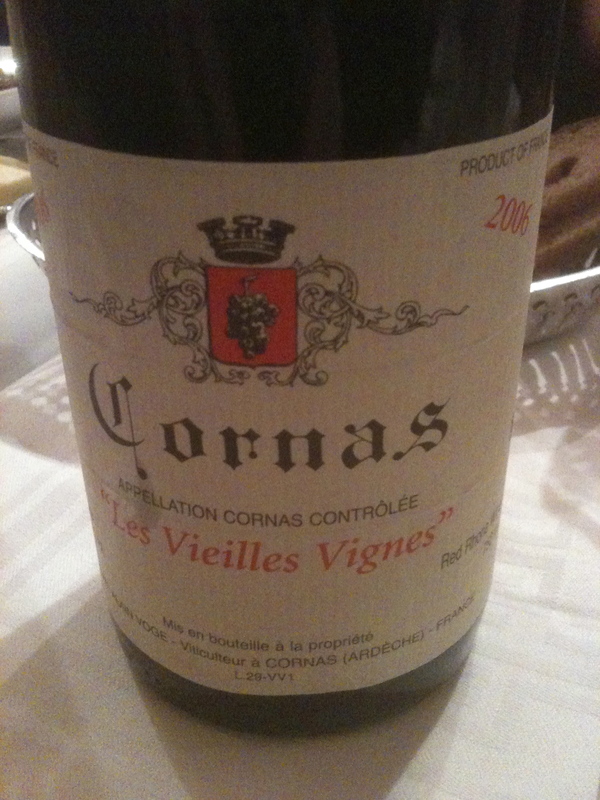 With the liver I chose to drink a Cornas “Vielles Vignes” 2006 100% Syrah from Domaine Alain Voge. Cornas is a village in the Northern Rhone. The vineyard is 6.5 hectares; the vines are over 30 years old on decomposed granite slopes also know as “gore”. Harvesting takes place by hand in mid-September. After the grapes are destemmed they are fermented in temperature controlled small stainless steel vats 30 to 50 HL. Aging is in casks, the duration depending on the vintage. This is a big wine with a lot of dark fruit aromas and flavors and a surprising touch of violets. I like Cornas and find it to be a bargain compared to some or the other Northern Rhone appellations. La Regalade – 49 Jean Moulin. This just might be my favorite bistro in Paris. The first time I went there I had duck in a fig sauce and I almost came off my chair. We go there whenever we are in Paris. Michele likes it so much, she brought their cookbook. When you sit down they give you a large terrine of pate de campagne and a crock of cornichons with bread that is toasted and crunchy. You can eat all you want! It is so good it is difficult to stop!! But I did stop for I knew what was to follow. For the first course I had lentil soup garnished with crisp bacon and bleu d’auvergne, a creamy blue cheese. This was followed by roasted pork poitrine on a bed of lentils and celery root puree. Dessert was a Grand Marnier soufflé–it is the best! 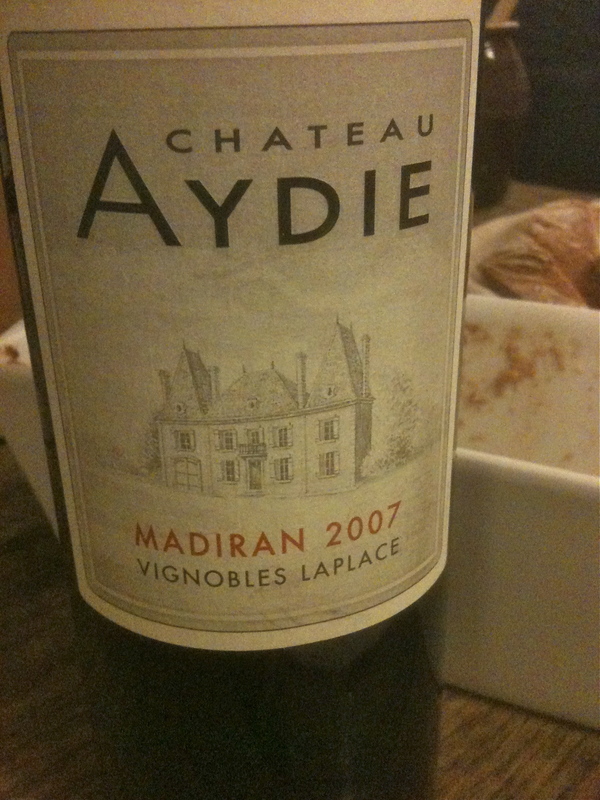 On the wine list was a Madiran 2007 from Chateau d’Aydie 100% Tannat. The winery is in Gascony in Southwest France. The fermentation is effected not by pumping but by délestage( a French term for racking the wine), the wine is regularly racked completely and rebottled on the pomace. Micro-oxygenation (a very small dose of oxygen is introduced into the wine) is also used. This is a big dark wine with black fruit flavors and aromas and went very well with the pork. Sunday Brunch or Lunch at Drouant at 18 place Gaillon When we were seated in this very comfortable and attractive restaurant we were given the menu and noticed there was an extensive brunch menu and the waiter recommended that we try it. As we looked around we noticed that most of the patrons were speaking French and had ordered brunch. Most of the Americans including the ones sitting next to us ordered lunch. Once I saw the wine list and heard the Sunday lunch special, it was lunch for me. My first course was called the “Classic” four small plates: Leeks in vinaigrette, Duck foie gras in port, a terrine of chicken and egg in mayonnaise. 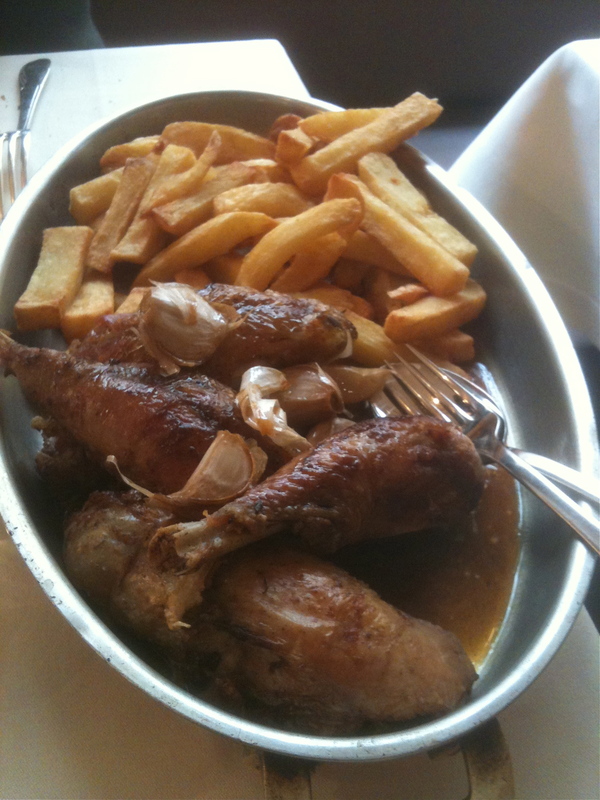 Their special on Sunday was roasted chicken with frites, how could I resist? I had the “classic” dessert quartet–baba doused in old rum, vanilla ice cream, apple tarte tatin and lemon meringue pie. 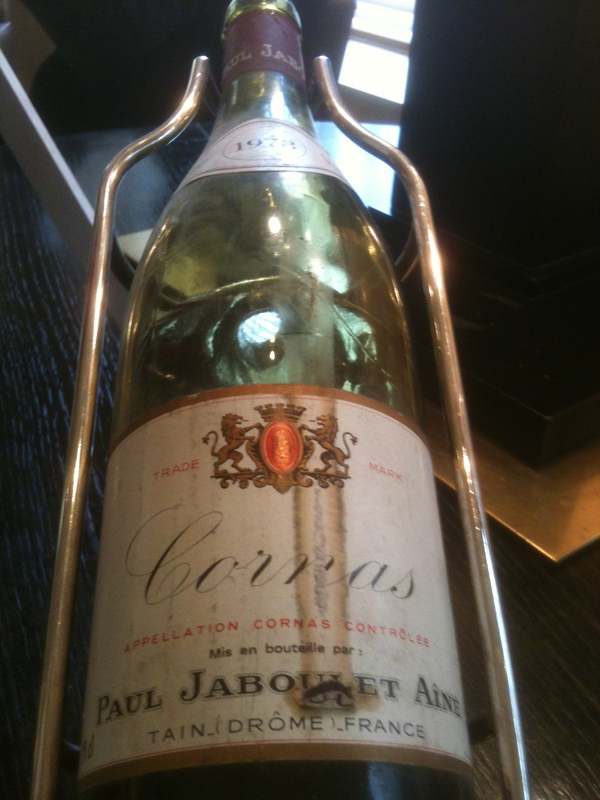 They have a very good wine list and when I spotted the Cornas 1978 100% Syrah Paul Jaboulet Ainé I ordered it. I knew it would cost more at retail or at auction. In his book The Wines of the Rhone Valley and Provence Robert Parker states: “This is the best Cornas I have tasted from Jaboulet”. He describes it as “ a profound bouquet of truffles, earthy blackberry fruit, smoked meat. This very concentrated wine is just hitting its apogee where it will no doubt remain for another 6-10 years.” He was right — except he tasted the wine in 1984 and said it would peek in1994 but it is now 2012 and the wine was amazing! Lavinia is a large wine store at 3 Boulevard de la Medeleine that has a modern, comfortable restaurant upstairs. It seemed to be very popular with people working in the area. What makes this very interesting is that you can buy the wine in the store, pay the retail price, and bring it upstairs and drink it with your meal at no extra charge. I ordered a terrine of foie gras to start and then a perfectly cooked cassoulet that was just the way I like it–not too thick. In the store I had selected a Gigondas 2000 made from 80% Grenache, 10% Syrah/Cinsault, 5% Mouvedre and 5% Clairette ffrom Domaine Les Pallieres. Vieux Tèlégraph and Kermit Lynch now own this winery. The property is located at the extreme end of the appellation. The vineyards are on steep terraced land, at 250 meters. The grapes are partially destemmed and pressed gently by a pneumatic press. Temperature controlled fermentation takes place for 25 to 20 days in cement cuvees and 7 to 9 months in foudres. The wine is bottled unfiltered and released two years after the harvest. Chez Joesphine–Dumonet 117 Rue Du Cherche-Midi This is another classic bistro that Michele really likes. I started with a half portion of foie gras. One of the specialties was Mille Foglie of Pigeon and confit legs. How could I resist. 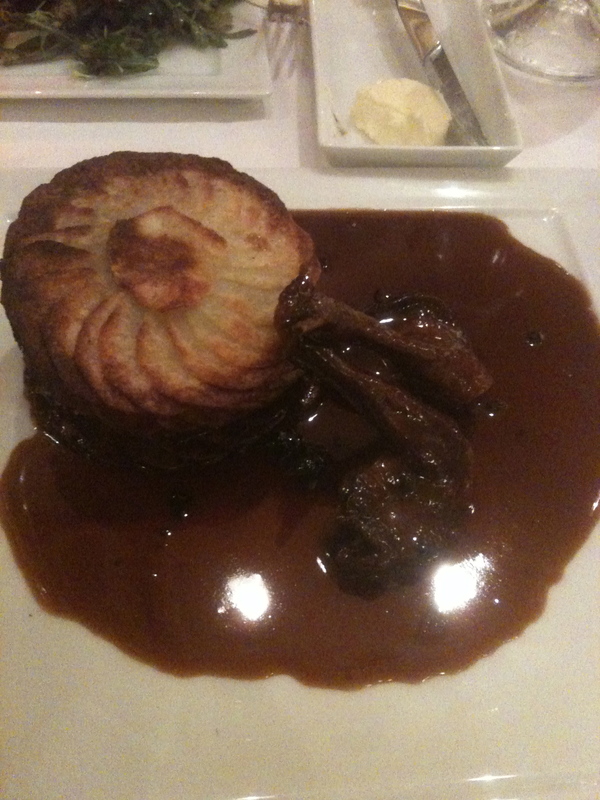 The perfectly cooked rare breast was in a red wine sauce with crisp potato pinwheels separating each layer. For dessert we shared an apple tart with great puff pastry. The wine was a Corbiéres Boutenage 2009 Made from20% Syrah.%40% Carignan 30% Grenach and 10% Mourvedre Domaine De Villemajou of Domaine Gerard Bertrand. This is a recent wine appellation of the Languedoc region (2005) in Southern France. Named after the town of Boutenage which is at the center of the area. This is a fruity wine with black and red fruit aromas and flavors and hints of black berries and spice. 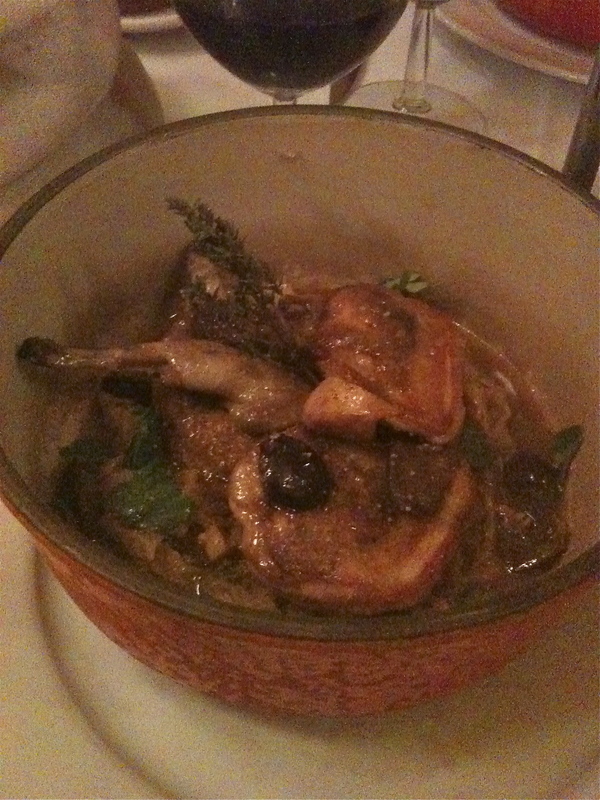 I had lentil soup to start followed by roasted quail that was excellent. 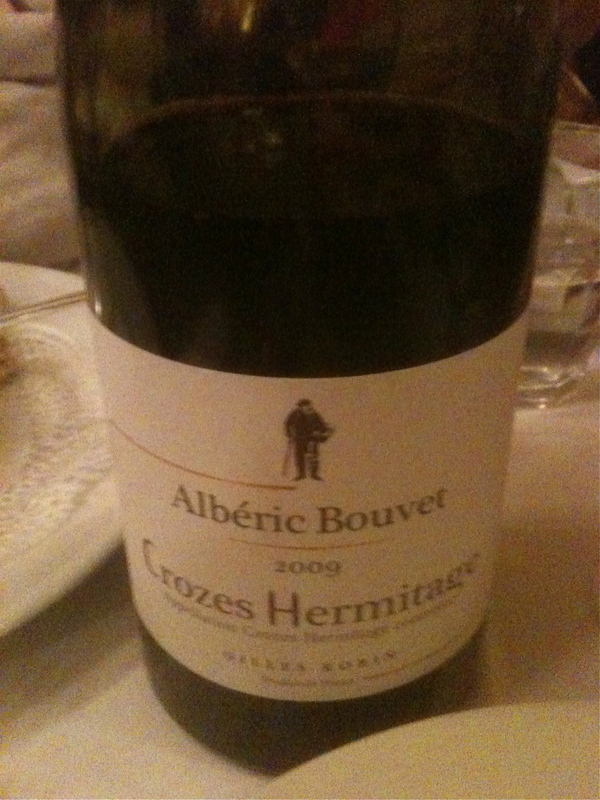 We drank Crozes Hermitage 2009 Cuvee Albèric Bouvet made from 100% Syrah, Domaine Gilles Robin. The wine had flavors and aromas of black fruit, hints of cassis and blackberry and touches leather and tobacco. It was a perfect combination with the quail. Note- Jaques Genin 133 Rue Turenne a great place to have hot chocolate, tea and pastries. The candies are outstanding. We shared a mille feuile with chocolate praline filling. And then there are the Caramels! They are expensive but worth it-they are indescribably delicious! Chef Christian Constant has several restaurants on the rue Saint Dominique that was right around the corner from our apartment. For breakfast we would go to Café Constant #139. It has the best coffee in Paris and the bread, butter and jam was delicious. Café Constant “Les Cocottes” #135 looks somewhat like an American wine bar. The specialty is casseroles served in cocottes, small covered cast iron pots that are brought to the table. We had such a great time that we have decided to go to Paris at least once a year. We hope! How many pounds did you gain? Ciao Michael, Thanks – it was a great trip! Bonjours, Charles! Your descriptions are making me salivate! Can’t wait to return to the City of Lights including all of the stops/wines you have mentioned. I have been drinking a lot of Italian wines lately but you ran through what could have been some of a greatest hits of my favorite french wines and dishes. Viva la France! and thanks.